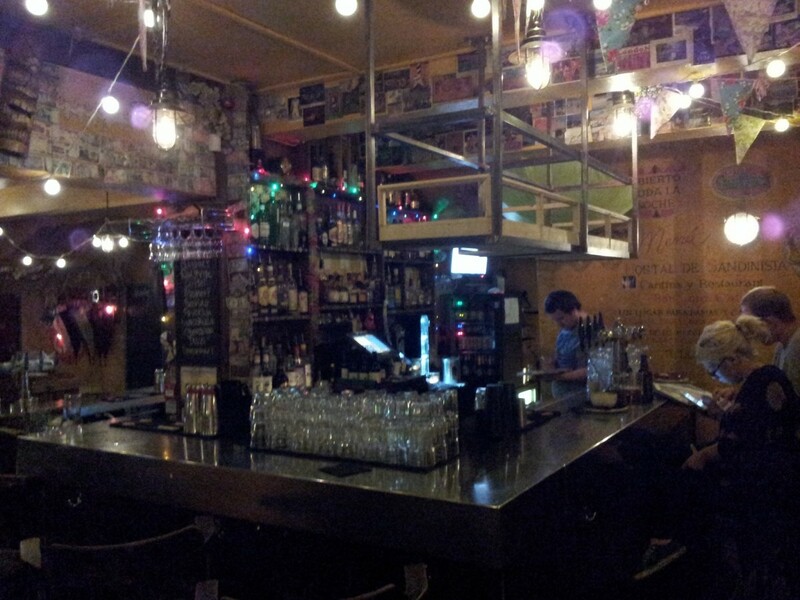 Home » Bar reviews » Sandinista! 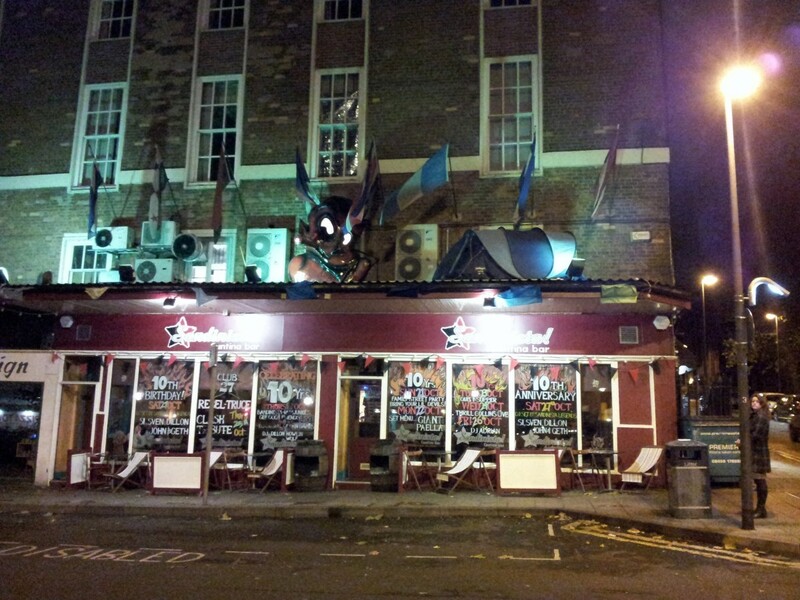 The weird devil head above the marquee makes Sandinista! easy to spot. 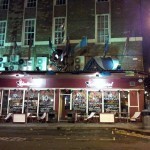 The authors of this blog may be a little biased toward Sandinista!, as it’s where we met and had our very first date. With that disclosure out of the way, Sandinista! 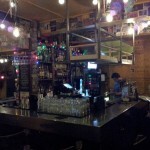 is a lively cantina with excellent tapas and a very decent beer selection to wash it all down. Though they seem to focus primarily on cocktails, their bottled beers include Odell’s IPA, Quilmes, Negra Modelo and Brooklyn Lager. (Any bar that stocks Brooklyn is going to get high marks from us!) On our visit they were also offering a special craft ale called Sandino, a 10th-anniversary collaboration with Ilkley Brewery, but we imagine supplies are limited. Their electric taps pour one Ilkley MJ beer, along with Guinness and Amstel. Prices are pretty middle-of-the-road, with beers from £3.30-£5.50 and cocktails at £6-£7. The décor and music selection invokes a Latin-America-meets-British-indie feel, and given that the bar is named after a Clash album, this is quite fitting. The atmosphere varies wildly based on time of day and day of the week. They’re clearly going for a club feel, and often have live music or a DJ to get people dancing. It’s always noisy, and on weekend nights it can get insanely crowded. Go early if you’re looking to enjoy a meal with relaxed conversation. Later on it will be a perfect place to dance the night away, but not so much for a quiet drink. I get the feeling this place has gone downhill a lot- they used to take their food very seriously and it was a guaranteed place for good tapas and South American food. It also used to be a great night out. The last few years have been very humdrum, while the night crowd is just too packed and dark to be considered enjoyable. They also scrimped on the rum a few years back meaning mixers just aren’t as tasty. The staff are nice and well-meaning, but the beers are only so-so these days. It’s lacking a bit of direction and identity now and has fallen well down my pecking order.